The year 2014 starts with the formation of new mobile malware like ‘Android.HeHe’, with the ability to steal text messages, intercept phone calls, and other malware such as ‘XXXX.apk’ uses WiFi networks or hotspots to steal information, infected more than 24,000 Devices. But it should not be forgotten by us that 2014 marks the 10th Anniversary of the World’s First mobile malware. FortiGuard Labs has published a whitepaper that briefly explains the major mobile threats from 'Cabir' to 'FakeDefend' over the last decade. The world’s first mobile malware was 'Cabir', detected in 2004 when mobiles were not so popular among all of us. It was developed by the group of hackers known as 29A, designed to infect the Nokia Series 60, the most popular Smartphone platform with tens of millions users worldwide at that time. The name “Caribe” appears on the screen of the infected phones and the worm spreads itself by seeking other devices such as phones, printers, game consoles which are within the Bluetooth connectivity of that phone. The virus had been detected in more than 20 different countries, including the U.S., China, Russia and Finland, where Nokia is headquartered. The malicious software has destroyed files that forced phones to dial expensive 900 numbers or 911, and made them crumble under denial-of-service attacks, in which the device gets so much inbound traffic that it can't function properly. At that time, the cyber criminals were simply molding the Bluetooth capabilities and finding out new tactics to infect mobile devices. A year later, some new variants of the 'Cabir' mobile virus were detected, called Mabir and CommWorrior that had ability to spread itself by Bluetooth as well as MMS, propagating itself via MMS service to all contacts contained in the infected phone. Thereafter, in 2006, RedBrowser hits the market beating all the previous ones by infecting phones via the universally supported Java 2 Micro Edition (J2ME) platform, allowing the Trojan to target a larger audience, regardless of the phone's manufacturer or operating system and to leverage premium rate SMS services that charged the phone’s owner approximately $5 per SMS. 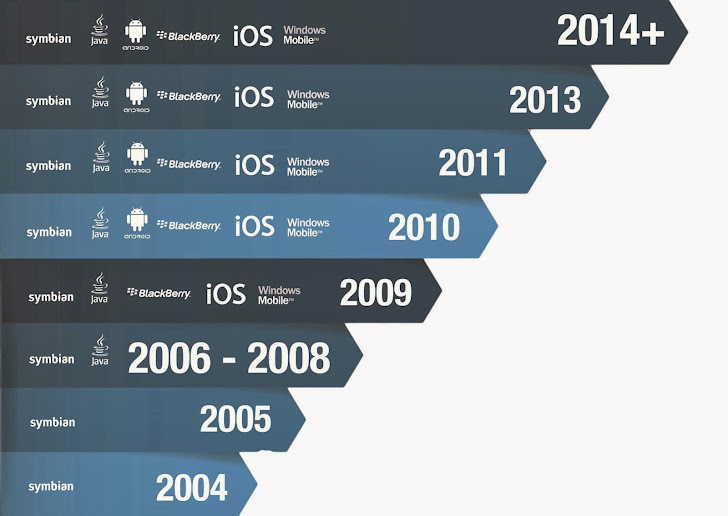 The years passed on with the formation of major mobile malware that marked its existence in mobile malware history. In 2013, Fortinet’s FortiGuard Labs saw more than 1,300 new malicious applications per day and is currently tracking over 300 Android malware families and over 400k malicious Android applications. According to Juniper Networks' annual Mobile Threat Report, mobile malware grew by 614 percent from March 2012 to March 2013. This equates to 276,259 troublesome apps and vulnerabilities. Now, after the arrival of large number of Mobile Platforms that are becoming smarter by the time, the landscape of mobile threats have changed dramatically and cyber criminals are trying more sophisticated ways with the only soul purpose of making money. Want to stay safe out there? Run software updates on your phones and avoid buying apps from unknown app stores.